There are about 7,000 languages known to be in active use today, and at least one book of Scripture exists in almost 2,900 of these languages. At least 1.3 billion people do not have the full Bible in their first language. Over 634 million of these have the New Testament; others have portions or at least some level of Bible translation work begun. Current estimates suggest that around 180 million people speaking at least 1,860 languages are understood to ‘likely need Bible Translation to begin.’ These people cannot hear God speak to them in the language they understand best. Perhaps they have access to Scriptures in another language, but the impact is different when you hear the gospel message in the language you speak at home. Join the growing global prayer movement for Bible Translation ministries. God is accomplishing His mission through His power and through partnership. Ministries such as Wycliffe Global Alliance, The Seed Company, United Bible Society etc, and churches are working together in many ways so that many more people will have access to God’s Word in the language they understand best. 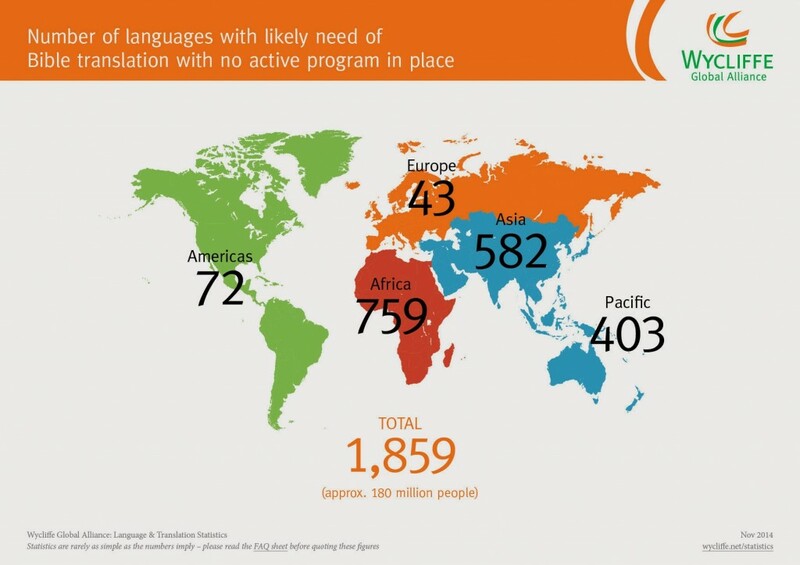 We’re on a Mission to see ALL Languages have Scripture by 2025.